By John L Daniels Jr. When I attended the Baltimore comic-con in 2005, I was so excited after 30 years of an appreciation of comics, this was my first convention. I meet artists, writers, editors of so many different facets. While perusing the many exhibitor tables I came across a young man sitting at a table. On the table was memorabilia of a golden age super-hero that I distinctively identified as The Green Lantern. The original Green Lantern “aka” Alan Scott wore a creative costume. The Green Lantern wore a red shirt, green tights, purple cape, yellow boots, and yes he wore a mask. The Green Lantern powers came from a ring crafted out of a mystical green metal and when it was charged by a green lamp formed from the same metal the bearer of the ring could perform mystical manifestations on metal with the ring. Also on the table were original sketches, signed books, and replica rings. I asked the person was he the artist? The young man looked at me curiously and gave me a disturbing reply of “NO” I said, where were they? He looked at me as if I was truly clueless and answered “He is ninety years old; it will take him some time to get around.” I said ok and said I will stop back later. I never had the time to stop back to get to meet him. Unbeknownst to me I had a rare opportunity to meet the legendary creator and artist, Martin Nodell. It hurts even more that on 12/13/06 the legendary artisan passed away. In life we go about our daily lives and do not comprehend the many missed opportunities that we have a chance to experience. Are there regrets? Yes and many more to come. The point I am conveying is “life is short; the people you meet along the way are chance meetings. In every chance meeting take time to talk and befriend someone just for a few moments. You may never know what part they may play in your daily life years to come. To Martin Nodell’s family and friends, Marty’s Light will always remain bright. By John L. Daniels Jr. It all started with a letter sent to his favorite Comic Book artist Alex Toth. Twenty years later this letter and countless others including doodles and artwork from Alex Toth is a living written memorial from one of the greatest animation and comic book artist in the medium of comics. The book collaboration is between John Hitchcock and the late Alex Toth. An enduring friendship of written correspondence and art. The book has countless doodles that display the extraordinary skills of Mr. Toth. The book, also includes a couple of interviews with the artist given by Mr. Hitchcock himself. I had the opportunity to interview Mr. Hitchcock about this incredible book of comic book history. What was your inspiration to write Mr. Toth? In addition, what were your expectations from the reply? Inspiration? Well, I just wanted him to know I respected his work. 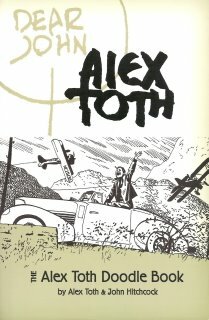 And I had very little expectations, he was Alex Toth, a legend, I was very surprised he would even bother to write back. I had no idea that he was a motivated letter writer and we became quick friends. Did you ever imagine in your wildest dreams that you would become good friends with a legend? No, but he knew that I loved comics as much as he did. That is a very good ground to begin with. Alex became Alex the friend I called and wrote letter too not “The Alex Toth”. I had to separate the two to continue to write him. Al Williamson is a very good friend and he told me that he lost a lot of friends because they couldn’t get over the fact that he was “The Al Williamson”. So he asked me to just think of him as Al. That made me understand that these famous artists are people like you and me. They like to tell a joke, laugh and have a good meal. It is simple. How did you feel when you received the first Doodle? The first thing I received was a Zorro commission and I was started by it. Alex asked me to break down the art that I wanted! Can you imagine how stupid I felt trying to do a breakdown for Alex? He got the breakdown and did something that was totally different. It was better than anything I could even dream off but I was started that he would ask and just blow my effort off. But that was Alex, he did everything his way. Why he asked, well who knows? How would you describe his character and demeanor towards his craft and life during his correspondence between you both? he would ask me what was good in comics today and to please send him a few copies of the “ good stuff”. Do you think he was a perfectionist at heart? Do you think he was his own worst critic? No doubt about it. He only saw the mistakes in his own work. Mr. Toth characterizations amazingly presented in his artistry in each of the mediums he drew. How did the comic book world, as well as the animation community perceive him? In both worlds he was respected as a genius, no doubt about it. But he never ever thought about himself that way. The one thing I have noticed is that the bigger they are the more insecure they happen to be. What was your favorite story or character drawn by Mr. Toth and why? I have to many favorites to pick one but today I would pick the Archie Goodwin story from Blazing Combat#3 “Survial”. I was just looking at it last week and it totally messed me up. Alex captured the element of being alone, to be totally isolated in that story. The whole atmosphere of this story could only be captured in black and white. And only done right by Alex Toth. I was very happy that Alex agreed to talk about this story and you can read his comments on the tothfans web site. How did it feel to sit and was a featured panelist with Mr. Toth's son at the San Diego Con? I was very honored to be sitting with both his oldest son Eric and his oldest daughter Dana. The next day I got to meet all four of Alex’s family and one grand son. I gave them all a copy of the Doodle Book and then I got them to sign a copy for Billy Ingram the guy who did the computer work on the book and one for me. They are all very nice people and I was glad they were there. Dana even brought with her Alex’s ashes to the panel. She wanted him to be there. Is there a point in time after his passing fans who may not have known him may get an opportunity to admire and appreciate him with this book? Well I hope so. I think the Doodle Book is as close as anyone could get to knowing the guy. It is a very personal look at this amazing artist. I think on my best days I would hope that this book would be an introduction to Alex’s career. And that it would help people discover his work. Are you going to be working on any other writings or book projects in the future? Jeff Parker, the publisher of the Doodle Book was contacted by another publisher about publishing a hardback version of this book. That would be a great idea. I have over 150 letters that we could use to add another 50 pages. We will see what happens. I am going to keep on writing and hopefully do another book on comics in the future. I always wanted to do a book called “ Everything you need to know about comic books to be cool”. You own your own Comic Book Shop in North Carolina, How did it feel among your peers to have a good friend such as the legendary artisan Mr. Toth? I think they are all bored with it by now. This book is all I talked about for five years and they are glad this is over with. But they always got excited when a card would come because they would read it before I did. My stores name is Parts Unknown and we have been open for seventeen years. Finally, is there anything you want to add that I may not have asked about the book? The only thing I want to add is that the loins share of the profits of this book will go to the Toth Family. I was going to force the profits on Alex but this will have to do. The Toth family told me that they want to start a scholarship in Alex’s name and I am thrilled that the money will go to such a worthy cause. When I get more information about donations towards that goal I will let you folks know about it. Thank you so much for answering questions for ComicStory-Arc Blog. The book Dear John: The Alex Toth Doodle book is an amazing title. I admire your dedication to the memory of this legendary artist and animator. Thank you John Hitchcock for giving fans a remarkable insight about a legendary artist Mr. Alex Toth.